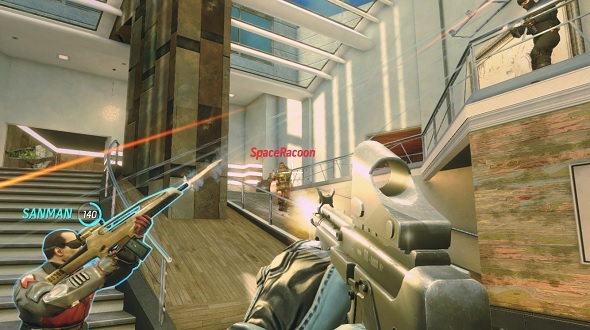 Free games: We’re giving away 100 Steam keys for no-nonsense online shooter Ballistic Overkill! Ballistic Overkill has some attitude. The developers over at Aquiris Game Studio have made an online shooter with a lot less of the nonsense you will find in other games in the genre. It’s all about heading into the fray and taking lives as quickly as possible. For the most part, it’s just you and a weapon, and the death of whoever is foolish enough to get in front of you. This is a class-based shooter, however – there are seven classes to choose from, with Aquiris promising that none play a support role, “everyone is a killer!” One specialises in stealthly assassinations, another in up-close brawls, while another marches into battle with a machine gun. There is also a marksman and an explosives maniac if those are more your style. Within those seven classes there is a lot of variation on offer so you can fine tune them to your tactics. This mostly comes in the form of the over 80 weapons that you can unlock and put into the hands of your chosen class. If you want more variation then there are weapon skins, too, which can be found in loot boxes and traded with other players via the Steam Marketplace. If you want to jump into Ballistic Overkill right now then be our guest – it’s available for a price over on Steam. However, we do have 100 Steam keys that will unlock the full game for you up for grabs. To be in with a chance of winning one you will want to enter the competition via the widget below.